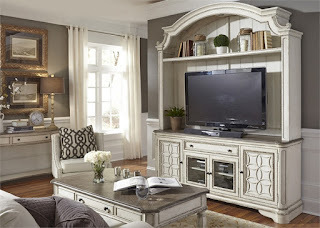 Magnolia Manor Entertainment Center in Antique White Finish by Liberty Furniture - 244-ENTThe Magnolia Manor Collection by Liberty Furniture offers gorgeous antiqued styled group that will bring charming aura into any decor! The furniture is made of Poplar Solids and Birch Veneers in Antique White Finish with White Oak Veneer Tops giving it a two tone look. Magnolia Manor 3 Piece Home Office Set in Antique White Finish by Liberty Furniture - 244-HO-3DHThe cases feature Canted Corners, Framed Drawer Fronts, Bead Molding, Rounded Pilasters, and Bracket Feet. The Credenza has Two Large File Drawers and Three Top Storage Drawers while the Planked Back Hutch offers Open Display for Storage and Touch Lighting.